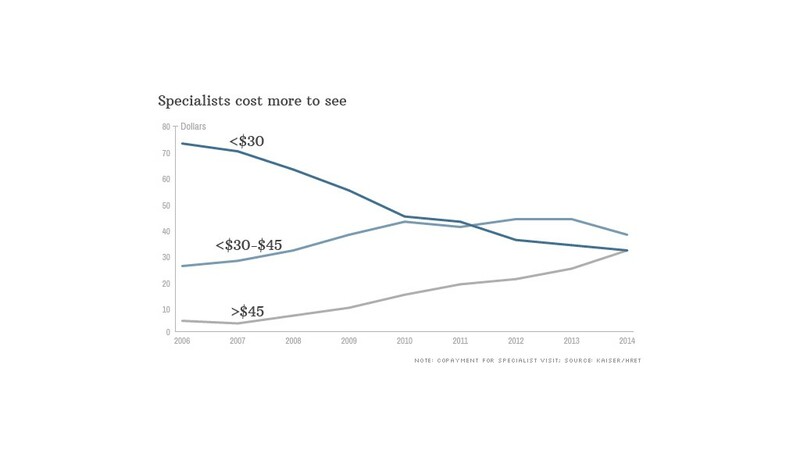 Health care spending growth may be at record lows in recent years, but employees are shelling out way more for premiums, deductibles, doctors' visits and drugs. Workers with solo coverage now pay an average of $1,081 in annual premiums, according to a Kaiser Family Foundation/Health Research & Educational Trust report released Wednesday. That's up a whopping 8.1% from a year ago. 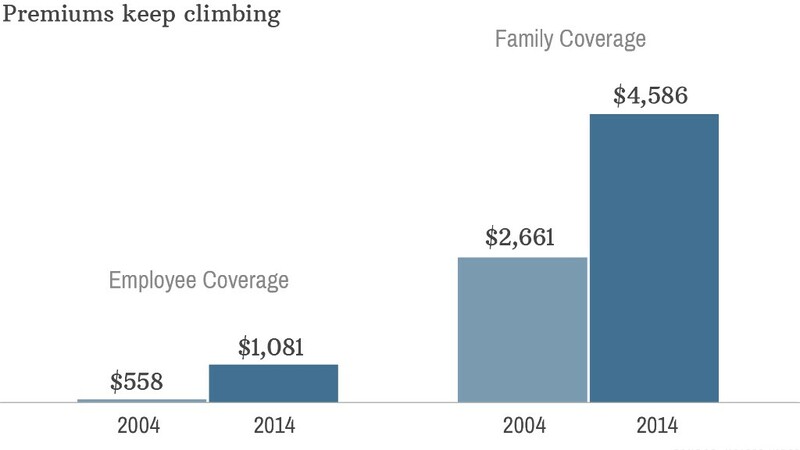 Family coverage costs workers an average of $4,823 a year now. That's up 5.7%, though Kaiser said the change is not statistically significant. Overall, average annual premiums (the total of what employees and employers pay for someone's health care) rose 3% to $16,834 for family coverage and stayed basically flat for single coverage at $6,025. Employers continue to pick up the majority of the tab, with workers shouldering 29% of the total family coverage premium and 18% of the employee-only premium. Looking at health care costs today versus a decade ago is telling. Not only are workers paying more in premiums, they are picking up more of the tab at the doctor's office and pharmacy. This is one way that companies are keeping premium hikes under control. Most workers have to rack up big bills these days before their insurance even kicks in. 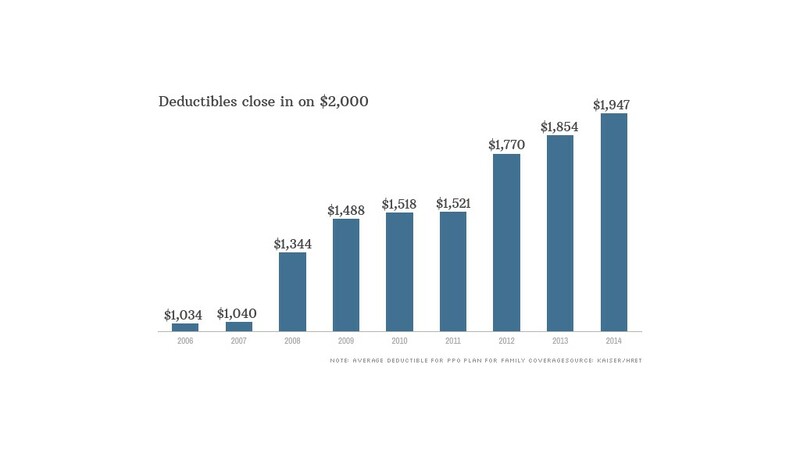 Not too long ago, half of employees had deductibles below $500. Now, only one-third do. Instead, companies are offering more insurance plans that come with high deductibles, some of which top $2,000 a year. These plans often have lower deductibles and are paired with health savings accounts. Some employers will partially fund the accounts to lessen the deductible's bite. Smaller firms with fewer than 200 employees are almost twice as likely to have employees enrolled in plans with annual deductibles exceeding $2,000. 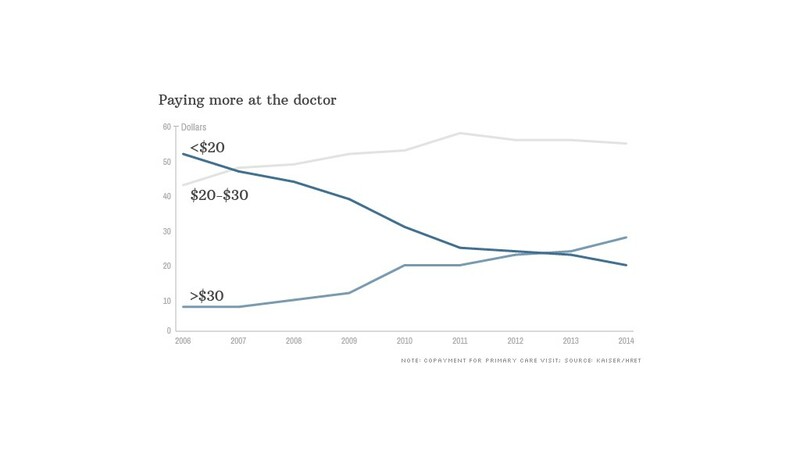 Less than a decade ago, half of workers could see their primary care doctor for less than $20. Now, it's getting more common to pay over $30 -- or even $40 -- for a visit. Nearly 75% of workers have co-payments, with the average amount being $24. Another 18% have co-insurance, where employees pay a share of the visit's bill, often close to 20% of the total amount. The average specialist co-payment is $36, but nearly a third of workers have to pay more than $45. Co-payments are still more prevalent, but 21% have co-insurance, where they have to pick up about a fifth of the tab. 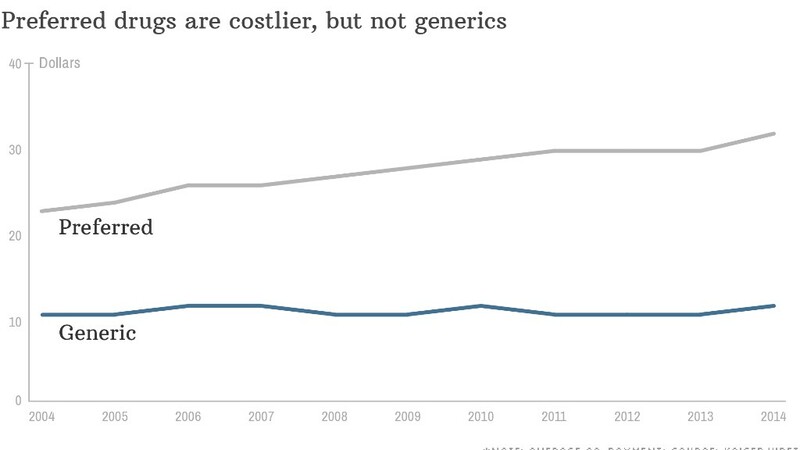 The price for generic drugs has stayed relatively stable in recent years, but the cost of preferred prescriptions has been creeping up. Companies responded by creating different tiers of coverage. For instance, workers who opt for a brand-name drug instead of its generic alternative may have to pay an average of $53 for it, instead of $11 for the generic or $31 for a brand-name drug that doesn't have a generic equivalent. Insurance companies are also adding a fourth tier for certain complex medicines or so-called "lifestyle drugs," such as weight loss or erectile dysfunction prescriptions. This tier costs an average of $83.